A new laboratory research performance by Anna Furse, Athletes of the Heart, UK) in collaboration with Maja Mitic (DAH Teatar, Serbia) and Antonella Diana (Teatret OM, Denmark) based on Henrik Ibsen's 'The lady from the sea' (1888). The project is an AHRC/ACE funded project as part of the Pinter Centre for Performance and Creative Writing's Fractured Narratives project. 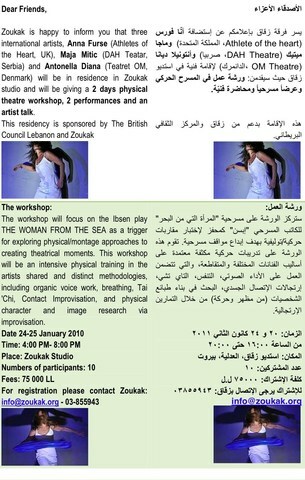 It has been touring in the UK and to Beirut, Lebanon.